I love the product, the material is very soft and comfortable. The color of the dress is vivid as what you see on the pictures in the store. The sewing in it is pretty decent. I don't see any tangle threads around and the dress is made of a good quality material. I picked Medium, the sizing is very precise. I was thinking I'm large due to the measuring guidelines they have online, but I go with my instinct and because I still have my post-pregnancy weight, I'm sure that I'll shed this sooner or later and I'll go by Medium size. The elastic and the off shoulder design is very elegant. This dress can be worn on any occasion, whether if it's casual or just normal event. The only thing that I never like is the way they ship the product. It doesn't bother me what kind they use, but when I received my merchandise in the mail and this was mailed at our Post Office, I saw a huge ripped in the big not bubble wrap envelope. It seems like the item, is mailed through an ordinary envelope, though the dress is wrapped in its original plastic bag. But still, seeing that the main packaging envelope is ripped I was very concerned that my item inside is busted. I always know that if there's some issue, I could always return and exchange the item. Yes, now instead of enjoying the dress itself, I have to go all through the procedure before I could finally use the dress. What if I bought it because of some very important occasion? And I can't use it because of the issue? This is the kind of things I'd like to prevent whenever I purchase something online. Whether if it's a gadget, dress or food. My point of buying online is the same function I purchase in store. For the Price of $26.40, I would say, it is quite right for the product itself. You would know why when you finally received the dress. 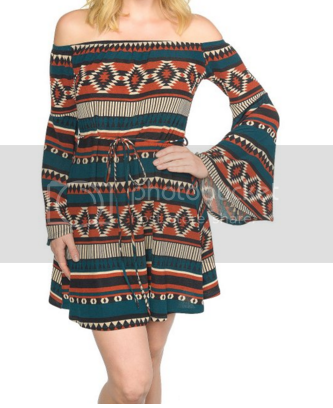 Other than the mailing/packaging issue I have, I love the dress and would recommend this to any girls who likes to find something cool. I love that print but not fan of the design. Can't wait to see you in it. Knit dresses are so light and comfy! I love them as well. I love the pattern on this one! It's pretty! That's one lovely knit dress for you! Looking forward to seeing a photo of you wearing it.